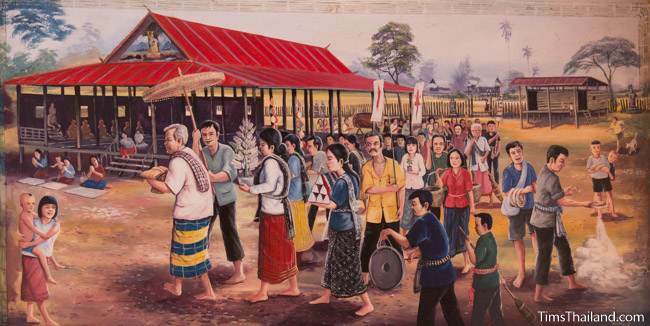 Boon Kathin (บุญกฐิน) is Month #12 of Heet Sip-Song – The Twelve Isan Merit-Making Traditions. Kathin is a robe-offering ceremony celebrated nationwide, not just in Isan. Communities lead processions to their local temple to give the monks complete three-part robe sets (trai jeewawn), as well as other necessities like sandals and soap. In the past, before ready-made robes were sold in shops, people made their own using a wooden frame called a kathin, and the finished products were called kathin robes, hence the name of the ceremony. The Kathin tradition began in the time of the Buddha who, after thirty monks got very muddy when travelling to see him, changed the rules about robes and allowed lay people to donate them in the month following the rains retreat. Previously monks could only wear robes made from discarded fabric that they found, usually in charnel grounds, and making robes took a lot of time, which was inconvenient for the monks. Back when the robes were woven and sewn by hand, it used to take three months to prepare for Kathin. Even though the offerings are now all store bought, Kathin has become a much bigger event, so the preparation still begins long in advance. Rather than being managed by the temple's lay community as is the case for all other religious observances, Kathin is usually organized (and funded) by a local bigwig hoping to make maximum merit. And though the Kathin ceremonies don't come as a surprise to the monks as they might have in the past, there's a bit of a symbolic separation kept between the temple and the organizers by organizing things outside the temple. On the day of Boon Kathin, most towns also organize other activities. Boat racing is a popular one, especially along the Mekong River. In Bangkok, the king always makes a donation of robes at a royal temple and every few years it's done with a royal barge procession on the Chao Phraya River to Wat Arun: it's an amazing spectacle. Boon Kathin has no fixed date.